As of 2011, the expanding offshore wind power industry has been the prime focus, and 75% of the company's work is based on offshore renewable energy. 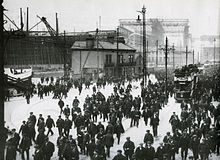 Workers leaving the shipyard at Queens Road in early 1911. RMS Titanic is in the background, beneath the Arrol gantry. The bow of SS Nomadic is at the far left. 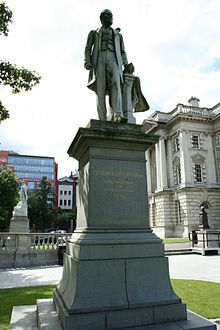 Harland & Wolff was formed in 1861 by Edward James Harland (1831–95) and Hamburg-born Gustav Wilhelm Wolff (1834–1913, came to the UK from age 14). In 1858 Harland, then general manager, bought the small shipyard on Queen's Island from his employer Robert Hickson. After buying Hickson's shipyard, Harland made his assistant Wolff a partner in the company. Wolff was the nephew of Gustav Schwabe, Hamburg, who was heavily invested in the Bibby Line, and the first three ships that the newly incorporated shipyard built were for that line. Harland made a success of the business through several innovations, notably replacing the wooden upper decks with iron ones which increased the strength of the ships; and giving the hulls a flatter bottom and squarer cross section, which increased their capacity. Walter Henry Wilson became a partner of the company in 1874. When Harland died in 1895, William James Pirrie became the chairman of the company until his death in 1924. Thomas Andrews also became the general manager and head of the draughting department in 1907. It was in this period that the company built Olympic and the two other ships in her class Titanic and Britannic between 1909 and 1914, commissioning Sir William Arrol & Co. to construct a massive twin gantry and slipway structure for the project. In 1912, due primarily to increasing political instability in Ireland, the company acquired another shipyard at Govan in Glasgow, Scotland. It bought the former London & Glasgow Engineering & Iron Shipbuilding Co's Middleton and Govan New shipyards in Govan and Mackie & Thomson's Govan Old yard, which had been owned by William Beardmore and Company. The three neighbouring yards were amalgamated and redeveloped to provide a total of seven building berths, a fitting-out basin and extensive workshops. Harland & Wolff specialised in building tankers and cargo ships at Govan. The nearby shipyard of A. & J. Inglis was also purchased by Harland & Wolff in 1919, along with a stake in the company's primary steel supplier, David Colville & Sons. Harland & Wolff also established shipyards at Bootle in Liverpool, North Woolwich in London and Southampton. However, these shipyards were all eventually closed from the early 1960s when the company opted to consolidate its operations in Belfast. A burner operating at night on the deck of a ship at Harland and Wolff's Liverpool yard (27 October 1944). In the First World War, Harland and Wolff built monitors and cruisers, including the 15-inch gun armed "large light cruiser" HMS Glorious. In 1918, the company opened a new shipyard on the eastern side of the Musgrave Channel which was named the East Yard. This yard specialised in mass-produced ships of standard design developed in the First World War. During the 1920s, Catholic workers were routinely expelled from working in the shipyard. The company started an aircraft manufacturing subsidiary with Short Brothers, called Short & Harland Limited in 1936. Its first order was for 189 Handley Page Hereford bombers built under licence from Handley Page for the Royal Air Force. In the Second World War, this factory built Short Stirling bombers as the Hereford was removed from service. With the rise of the jet-powered airliner in the late 1950s, the demand for ocean liners declined. This, coupled with competition from Japan, led to difficulties for the British shipbuilding industry. The last liner that the company launched was MV Arlanza for Royal Mail Line in 1960, whilst the last liner completed was SS Canberra for P&O in 1961. In the 1960s, notable achievements for the yard included the tanker Myrina, which was the first supertanker built in the UK and the largest vessel ever launched down a slipway, as it was in the September of 1967. In the same period the yard also built the semi-submersible drilling rig Sea Quest which, due to its three-legged design, was launched down three parallel slipways. This was a first and only time this was ever done. 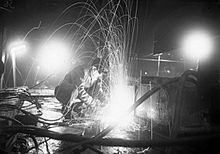 In the mid-1960s, the British government started advancing loans and subsidies to British shipyards to preserve jobs. Some of this money was used to finance the modernisation of the yard, allowing it to build the much larger post-war merchant ships including one of 333,000 tonnes. The shipyard already had a reputation as a protestant factory, and in 1970, during the Troubles, 500 Catholic workers were expelled from their role. Continuing problems led to the company's nationalisation, though not as part of British Shipbuilders, in 1977. In 1971, the Arrol Gantry complex, within which many ships were built until the early 1960s, was demolished. The nationalised company was sold by the British government in 1989 to a management/employee buy-out in partnership with the Norwegian shipping magnate Fred Olsen; leading to a new company called Harland & Wolff Holdings Plc. By this time, the number of people employed by the company had fallen to around 3,000. For the next few years, Harland & Wolff specialised in building standard Suezmax oil tankers, and has continued to concentrate on vessels for the offshore oil and gas industry. It has made some forays outside this market. The company bid unsuccessfully tendered against Chantiers de l'Atlantique for the construction of Cunard line's new Queen Mary 2. 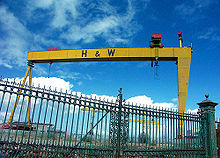 Faced with competitive pressures (especially as regards shipbuilding), Harland & Wolff sought to shift and broaden their portfolio, focusing less on shipbuilding and more on design and structural engineering, as well as ship repair, offshore construction projects and competing for other projects to do with metal engineering and construction. This led to Harland and Wolff constructing a series of bridges in Britain and also in the Republic of Ireland, such as the James Joyce Bridge and the restoration of Dublin's Ha'penny Bridge, building on the success of its first foray into the civil engineering sector with the construction of the Foyle Bridge in the 1980s. Harland & Wolff's last shipbuilding project was MV Anvil Point, one of six near identical Point-class sealift ships built for use by the Ministry of Defence. The ship, built under licence from German shipbuilders Flensburger Schiffbau-Gesellschaft, was launched in 2003. 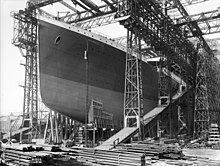 Harland and Wolff was nearly awarded the contract to build RMS Queen Mary 2 in 2003, but was not given the government guarantee necessary to do so. As a result, the contract was awarded to Chantiers de l'Atlantique. The ship entered service in 2004. In recent years the company has indeed seen its ship-related workload increase slightly. 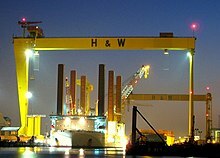 Whilst Harland & Wolff has no involvement in any shipbuilding projects for the foreseeable future, the company is increasingly involved in overhaul, re-fitting and ship repair, as well as the construction and repair of off-shore equipment such as oil platforms. On 1 February 2011 it was announced that Harland & Wolff had won the contract to refurbish SS Nomadic, effectively rekindling its nearly 150-year association with the White Star Line. Structural steel work on the ship began on 10 February 2011 and was completed in time for the 2012 Belfast Titanic Festival. In July 2012 Harland & Wolff was to carry out the dry docking and service of the Husky Oil SeaRose FPSO (Floating Production, Storage and Offloading) vessel. Belfast's skyline is still dominated today by Harland & Wolff's famous twin gantry cranes, Samson and Goliath, built in 1974 and 1969 respectively. 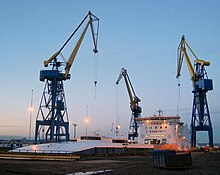 There is also speculation about a resurgence in the prosperity of the shipyard thanks to the company's diversification into emerging technologies, particularly in renewable energy development, such as offshore wind turbine and tidal power construction, which may provide an opportunity to further improve the company's fortunes in the long term. For example, the United Kingdom planned to build 7,500 new offshore wind turbines between 2008 and 2020, creating great demand for heavy assembly work. Unlike land-based wind turbines, where assembly occurs on site, offshore wind turbines have part of their assembly done in a shipyard, and then construction barges transport the tower sections, rotors, and nacelles to the site for final erection and assembly. As a result of this, in late 2007, the 'Goliath' gantry crane was re-commissioned, having been moth-balled in 2003 due to the lack of heavy-lifting work at the yard. In June 2008, assembly work at the Belfast yard was underway on 60 Vestas V90-3MW wind turbines for the Robin Rigg Wind Farm. This was the second offshore wind farm assembled by the company for Vestas having completed the logistics for the Barrow Offshore Wind Farm in 2006. In August 2011 Harland and Wolff completed the logistics for the Ormonde Wind Farm which consisted of 30 REpower 5MW turbines. In March 2008, the construction of the world's first commercial tidal stream turbine, for Marine Current Turbines, was completed at the Belfast yard. The installation of the 1.2MW SeaGen Tidal System was begun in Strangford Lough in April 2008. In July 2010, Harland & Wolff secured a contract to make a prototype tidal energy turbine for Scotrenewables Ltd. Manufacture of the SR250 device was completed in May 2011 and has been undergoing testing in Orkney since. As of April 2012, the booming offshore wind power industry has taken centre stage. Harland & Wolff are currently working on three innovative meteorological mast foundations for the Dogger Bank and Firth of Forth offshore wind farms, as well as putting the finishing touches to two Siemens substations for the Gwynt y Môr offshore wind farm. Seventy-five per cent of the company's work is based on offshore renewable energy. Harland & Wolff is one of many UK and international companies profiting from the emergence of UK wind- and marine-generated electricity, which is attracting significant inward investment. 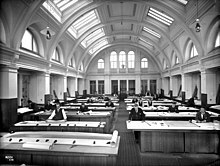 A collection of Harland & Wolff papers are held at Public Record Office of Northern Ireland (PRONI). Their "Introduction to the Harland and Wolff Papers" issued 2007, notes "The Harland & Wolff archive in PRONI comprises c.2,000 files, c.200 volumes and c.16,000 documents, 1861–1987, documenting most aspects of the history of Belfast's famous shipbuilding firm". A further major archive is held at the Ulster Folk and Transport Museum (UFTM). This has a photographic collection and a ships' plans collection (i.e., technical drawings). Around 8,000 prints of Harland & Wolff built ships covering the period 1890-1945 are held in bound volumes in the UFTM's library. However the UFTM's collection of ships' plans is not currently available to the public nor is there a copy service. Selected early ship's plans (dating from 1860 to 1882) are reproduced in a pictorial book by McCluskie (1998). Records relating to the Govan yard of Harland & Wolff plc are maintained by the Archives of the University of Glasgow (GUAS). ^ "Titanic - Home". www.nmni.com. Retrieved 27 March 2018. ^ Moss, M; Hume, J.R. (1986). Shipbuilders to the World: 125 years of Harland and Wolff, Belfast 1861–1986. Belfast: Blackstaff Press. pp. xvii, 601 p. ISBN 0-85640-343-1. ^ a b "Britain could lead world in offshore wind power". The Daily Telegraph. London. 14 February 2011. ^ "Walter Henry Wilson". www.gracesguide.co.uk. ^ "Harland and Wolff - Shipbuilding and Engineering Works". www.theyard.info. ^ Weston, Alan (18 February 2013). "Former Liverpool head office of Titanic builders Harland & Wolff to be demolished". liverpoolecho. ^ "Britain From Above". britainfromabove.org.uk. ^ "Sectarianism and the shipyard". Irish Times. ^ Pat Coogan, Tim (2015). The Troubles: Ireland's Ordeal 1966–1995 and the Search for Peace. Head of Zeus Ltd. p. 607. ^ Mullin, John (11 March 2000). "Harland & Wolff locks horns with DTI". The Guardian. London. ^ "List of Ships". theyard.info. Retrieved 12 March 2018. ^ The Genesis of a Queen: Queen Mary 2. YouTube (2012-01-18). Retrieved on 2013-07-23. ^ McCarthy, Michael (24 January 2008). "Britain will need 12,500 wind farms to satisfy EU targets". London: The Independent. Retrieved 7 October 2008. ^ Harrison, Claire (2 June 2008). "Breath of fresh air for H&W with wind turbine venture". Belfast Telegraph. Retrieved 7 October 2008. ^ McDonald, Henry (31 March 2008). "Tidal power comes to Northern Ireland". The Guardian. London. ^ "Harland & Wolff Archive, Public Record Office of Northern Ireland". RASCAL: Research and Special Collections Available Locally (Ireland). Archived from the original on 14 September 2017. Retrieved 14 September 2017. ^ PRONI (2007). Introduction Harland and Wolff Papers (PDF). ^ McCluskie, Tom (1998). Ships from the Archives of Harland & Wolff: Builders of the Titanic. London: PRC Publishing Ltd. p. 160. ISBN 1 85648 467X. ^ "Records of Harland & Wolff plc, shipbuilders, Belfast, Co. Antrim, Northern Ireland and Govan, City of Glasgow, Scotland - Archives Hub". archiveshub.jisc.ac.uk. Cameron, Stephen (2011). Belfast Shipbuilders: A Titanic Tale (1st ed.). Colourpoint Books. ISBN 978-1-906578-78-7. This page was last edited on 24 February 2019, at 16:13 (UTC).